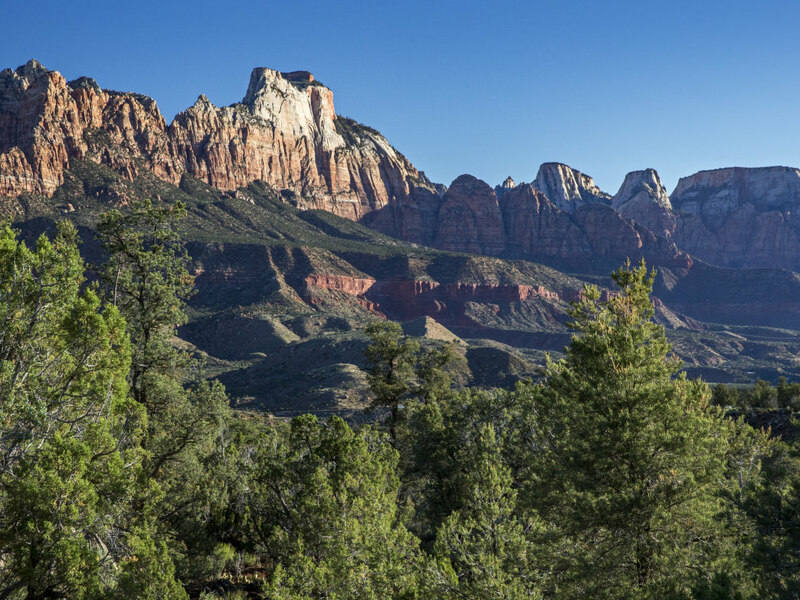 The Eagle Crags Trail offers a spectacular 5.7-mile, out-and-back hike up dry washes and steep slopes covered with juniper and piñon pines to an overlook with stunning views across southern Zion National Park. The moderately strenuous hike takes about five hours and gains 900 feet of elevation from trailhead to viewpoint. 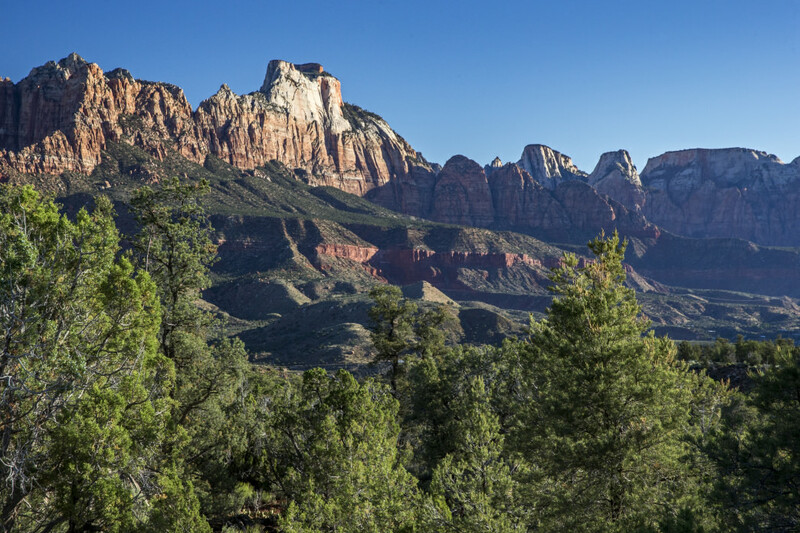 The Eagle Crags, a collection of spiked sandstone pinnacles on a high ridge, fills the jagged skyline above the Eagle Crags Trail parking lot in the dusty hills south of Rockville and the Virgin River. The vertical Vermillion Cliffs march away on either side of the spires, forming the southern boundary of Zion’s great canyons. The narrow, sandy trail crosses shallow washes scoured by summer flash floods and winds up at broad ridges sparsely covered with a pygmy forest of aromatic piñon pine and juniper. The cool air of a late October morning pushes down the steep mountain slope, carrying the harsh caws of ravens circling overhead. The Crags lie on Bureau of Land Management (BLM) public lands outside of 146,597-acre Zion National Park, a rocky wonderland of deep canyons carved by the Virgin River and its tributaries, and lorded over by towering buttes, mesas, spires, and slickrock mountains. The Eagle Crags lie at the northern end of a jutting rock peninsula that extends north from 7,363-foot Canaan Mountain, a huge sandstone massif flanking the south side of the Virgin River’s broad gorge. The trail to Eagle Crags is a great hike outside the busy park to a wild place with solitude and distant views. After a couple miles, the trail begins to climb steep red slopes toward the tilted sandstone towers looming above. Expansive views unfold as the trail switchbacks upward, with the grandiose Zion landscape stretching across the northern horizon. Cliffs formed by Navajo sandstone form high walls around Mount Kinesava and flat-topped West Temple, while abrupt Zion Canyon, carved by the North Fork of the Virgin River, drains south from the heart of the national park. A million years of time and the river flowing sliced through the red and white sandstone beds to carve the 2,000-foot-deep gorge. The trail wraps around a ridge below sharp Tooele Tower after a half-mile of climbing, and heads across a bench to the end of the maintained trail. This is a perfect spot to sit on a flat sandstone boulder, warmed by the sun, take off shoes and socks, and enjoy the scenery. The Eagle Crags tower above you, a jumble of eroded spires and blocky buttresses. Lake Creek Reservoir glistens to the east and beyond opens the mouth of Parunuweap Canyon, its tiered sides chiseled by the East Fork of the Virgin River into a layer cake of sandstone and shale. After a rest and drink of water, retrace your steps back down the trail to your vehicle. Ambitious hikers can continue on an unmaintained, primitive trail, doubling the round-trip hike mileage, to Lower Mountain and higher Canaan Mountain. Distance & elevation gain: 2.85 miles one way; or 5.7 miles round trip. 900 feet. Trail type: Singletrack dirt trail with rocky and narrow sections. Multi-use: Hiking, trail running, and horseback riding. Dogs: Allowed. Keep under control. Seasonality: Spring and fall are best. Summer is hot. Bring water; none available on the trail. Bathroom: Vault toilet at the trailhead. The trail is best hiked in the morning or evening when sunlight shafts across the rugged landscape, offering great photo ops. It’s best to avoid hiking in summer heat, except in the early morning. Nearest destination: Rockville on S.R. 9. Where to park: Eagle Crags Trailhead. From the Zion National Park South Entrance, drive 4.7 miles on S.R. 9 to Rockville. Turn south on Bridge Road, which turns into Eagles Crags Road, and drive two miles south to the trailhead.